The results of the point cloud classification are used for the DTM generation during step 3.DSM, Orthomosaic and Index: How to automatically generate a Digital Terrain Model (DTM). The point cloud classification requires a georeferenced project. Select the processing step 2. Point Cloud and Mesh. Select the tab Point Cloud. In the section Point Cloud Classification, select the box Classify Point Cloud. Process step 2. Point Cloud and Mesh. 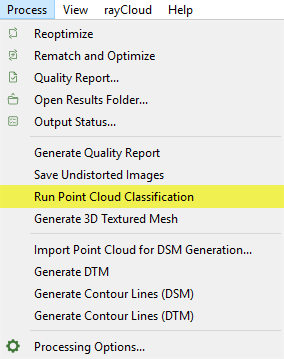 On the menu bar, click Process > Run Point Cloud Classification. Warning: When reprocessing step 2. Point Cloud and Mesh, the existing outputs and all edits will be deleted and overwritten. The Point Groups layer has a Display Properties sub-layer that can be used to select the point groups to be displayed in the rayCloud. 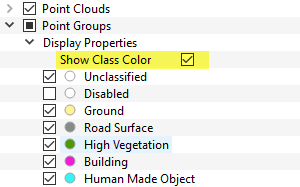 To visualize the point groups using the predefined classification colors the Show Class Color option should be enabled from the drop-down list. When the Show Class Color option is not enabled, the selected point groups are displayed with their original colors. Note: Preselected colors are applied to the predefined point groups. User defined point groups are displayed as white points. 2. On the left sidebar, in the Layers section expand the Point Clouds list and right click on the densified point cloud's name to be exported. 4. In the Export Point Cloud pop-up that appears, select the point group to be exported. 5. Select the desired format between the following options: LAS, LAZ, PLY, XYZ. Note: The classification labels are only exported for the LAS and LAZ file formats. 6. 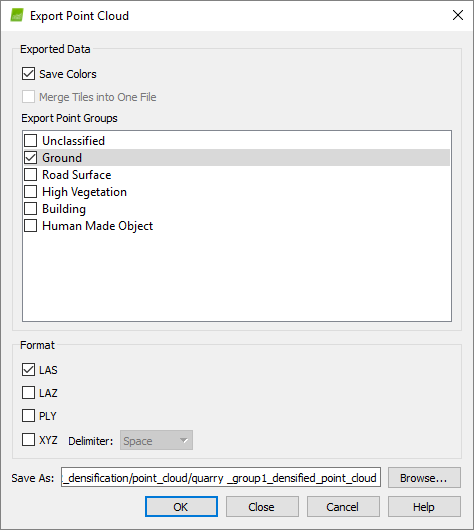 On Save As, type the desired file name. Note: By default, the file is exported in the results folder with the same name as the original point cloud. To avoid overwriting the original point cloud, the name or the destination folder should be changed. 7. Click Browse... to navigate to the path where the point group is saved. The point cloud classification is based on machine learning techniques which require training on labelled data. Both the geometry and the color information are used to assign the points of the densified point cloud in one of the predefined groups. The process performs well for environments similar to the ones of the datasets used for training the algorithm, such as rural, construction and vegetation areas. High vegetation and buildings are well-detected and classified. To learn more about the classification algorithm: Advanced knowledge - Scientific papers. Depending on the quality of the dataset and the type of terrain, there are areas where the classification is not expected to perform perfectly and there is a need for manual intervention. Mountains, quarries and concrete buildings might need further editing. In the future, more training data will be used to improve the algorithm and give more reliable classification results for different types of projects. Important: The classification algorithm performs better in projects with a GSD less than 5 cm. It is possible to edit the point groups to improve the results of the classification. Points can be reallocated among point groups. 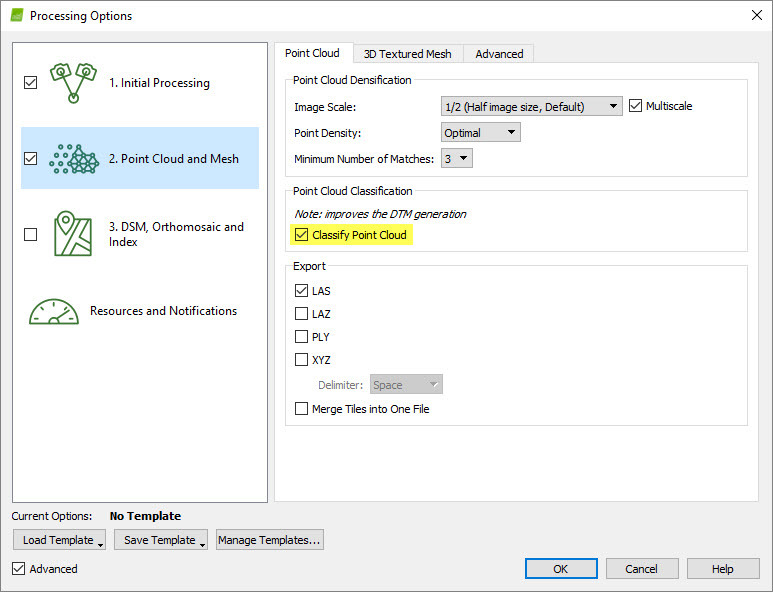 The points that are erroneously assigned to a point group can be moved to the correct point group using the Edit Densified Point Cloud option: How to edit the point cloud in the rayCloud. In my cloud point classification,I can get classification. i find error in ipx4d note,how to solve it? By the way,in other time,after run classification,my all points in pointGroups 'Unclassified'，What should i do if I want get right point cloud. This issue is related to the project path. It seems that the 李阳 name in the path creates the problem. Could you please try to create another project using a different path that does not contain folders having special characters or spaces, such as 李阳? I expect the classification to work this way. If not, please let me know to further investigate the issue. Thanks,I have solved this problem.However, the results of point cloud classification are not ideal.If I use point cloud editing in the Raycloud, the workload will be huge. Can I export the original point cloud file of pix4d and try to use other software to classify it? It is possible to export the point cloud and classify it in a third party software. Then you can import external point clouds back into Pix4D and use them for the generation of your DSM, orthomosaic, and all other outputs that are generated in step 3. Read here to learn more about importing an external point cloud into Pix4D for processing. Keep in mind that the contour lines can be generated based on the DTM or DSM and in case that you want the contour lines to represent the "ground level", we recommend using the point cloud classification. The results of the point cloud classification are used for the DTM generation during step 3.DSM, Orthomosaic and Index. This means that the purpose of point cloud classification is to automatically assign points to predetermined groups. Out of these groups (Ground, Road Surface, High Vegetation, Building, Human Made Object), only the Ground and Road Surface groups are preserved in the DTM. To improve the DTM, all the terrain points should be assigned to one of these point groups. To manually move points between the automatically generated point groups, the Edit Densified Point Cloud option can be used: How to edit the point cloud in the rayCloud.